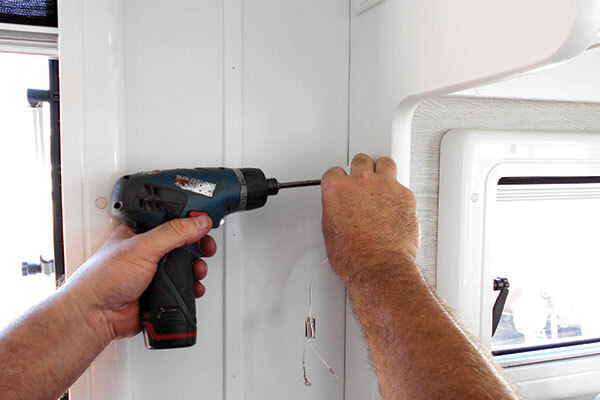 When you’re running an air-conditioner in your caravan or RV, you’ll require an output around 3000W. So when you’re off-grid, with the heat beating down relentlessly, 12V fans are must-have cooling accessories in your caravan or motorhome. For starters, they blow a good volume of air, can be pre-set to switch off once you’re asleep, and use minimal power – they won’t flatten your batteries, even if you run them all night. All in all, they not only help keep you cool (and keep your cool) but are essential during warm climate touring around Australia. 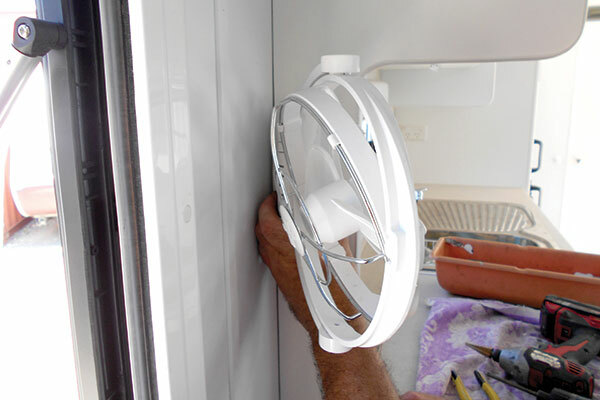 CW recently observed the DIY installation of a 12V Caframo Sirocco fan (which can be purchased from most reputable accessories outlets) on a Coronet RV caravan. On a relatively hot February day, it quickly proved a quiet, efficient and versatile cooling system. After a suitable location is established and 12V hardwiring is completed, the mounting plate is ready to be installed. 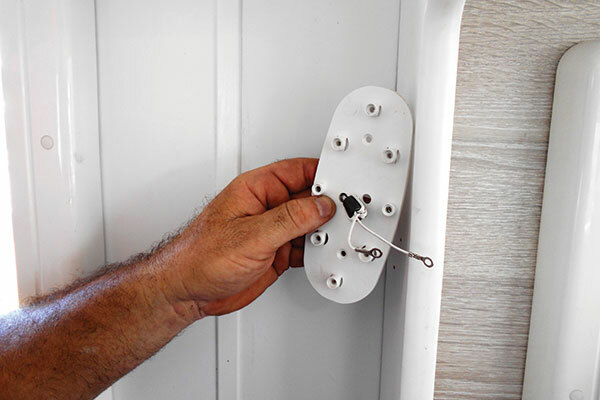 Handy hint No.1: It’s good practice to place the mounting bracket on a suitable location then drill a couple of pilot holes as shown. 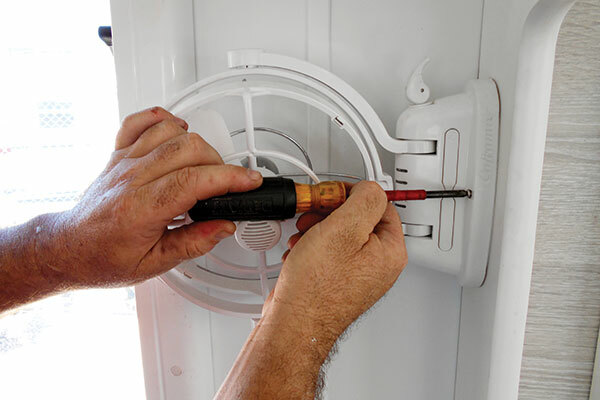 Handy hint No.2: When searching for the right spot to mount the fan, it’s advisable to seek solid material with no internal 240V wiring or plumbing. 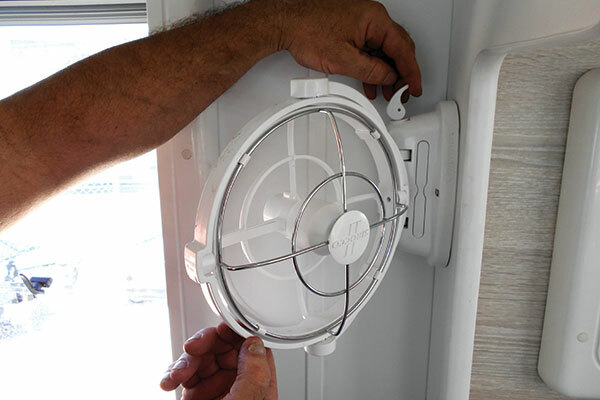 This Sirocco fan mounting plate was installed on an internal archway of the Coronet RV. With mounting plate affixed, it’s time to wire up the 12V to the fan base – follow the directions for positive and negative terminals. With the wiring completed, it’s time to install the fan to the mounting plate. Securely fasten the fan to the mounting plate. 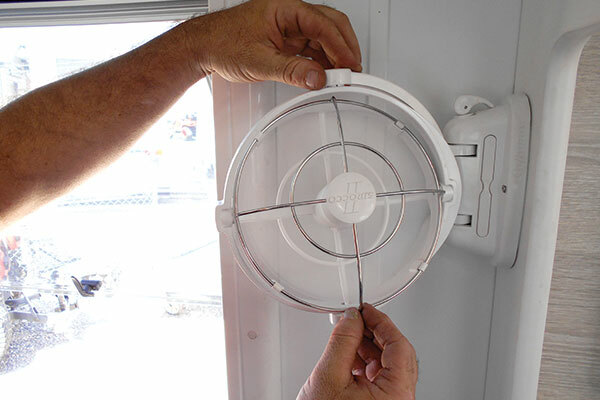 With the fan secured to the mounting plate, swivel the fan to the desired position and you’re ready to use it. The 12V Sirocco fan – which can be wired in or connected via a 12V plug purchased separately – has a long-life motor, three-speed push-button control, four preset timer settings and timer indicator lights. It boasts whisper-quiet operation, as the minimal grill and safe, flexible blade eliminate most noise. And the fan is also multi-directional – a unique, gimballed design enables airflow to be moved in a 360-degree rotation. A low energy fan for caravan and RV use, the 12V Sirocco fan delivers amazing output for so little battery draw. And its cooling qualities provide superior comfort. Versatility is another hallmark of these fans which can be mounted to any surface. They have limitless positioning options, and can be folded flat against the bulkhead when not in use. And they’re a compact fan, which is perfect for a caravan where space and versatility is at a premium. Key features of the 12V Sirocco fan include: auto shut-off at 10.5V; 0.4A operation at high speed; two mounting options; timer-controlled shut-off; bare wires ready to hard wire (no 12V connection provided); 1.3kg weight. Please note: As with all DIY projects, read through the safety and installation guidelines before proceeding. Remove the fan from the packaging and search for a suitable mounting location that will enable the mounting plate to be securely attached. As the fan will require 12V power only, you have the option to either use the CIG interface or you may consider hardwiring to existing 12V on board power via a fused link. 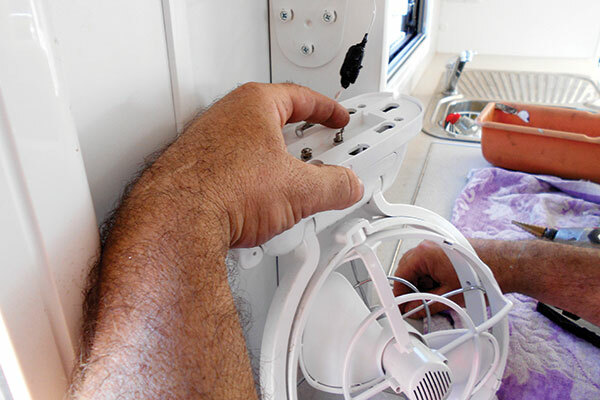 These images and step-by-step captions depict the simplicity of this installation of a 12V Sirocco fan performed by The RV Repair Centre foreman, Paul Hewat, in Bayswater, Vic.